InnChanter is located at Hotsprings Cove, Tofino on the West Coast of Vancouver Island. Direct charter flights via float plane from Vancouver to InnChanter can be booked through regional airlines. From Vancouver, drive north to Horseshoe Bay on Highway #1 (The Trans-Canada Highway) and take BC Ferries to Nanaimo (crossing time: ~ 95 minutes). Once off the ferry, drive north on the Island Highway to the turn-off for Port Alberni (Highway #4), then west towards Pacific Rim National Park and finally north to Tofino (travel time: ~ 3 hours). Tofinobus offers routes from Vancouver and Victoria to Tofino. Once in Tofino, you have your choice of flying in a seaplane or boating with a water taxi north to InnChanter. Both methods of transportation can be booked at the government dock. An ideal way to travel to the InnChanter is to take a whale watching boat up and fly back by seaplane. Please note that check-in is available after 4 pm. From Nanaimo, it’s a comfortable three-hour drive to Tofino through spectacular scenery and along beautiful fjords. Stop in Coombs to see the goats on the roof of the market! You also pass Long Beach in Pacific Rim National Park where you can see the surfers testing their skills on big wave days. 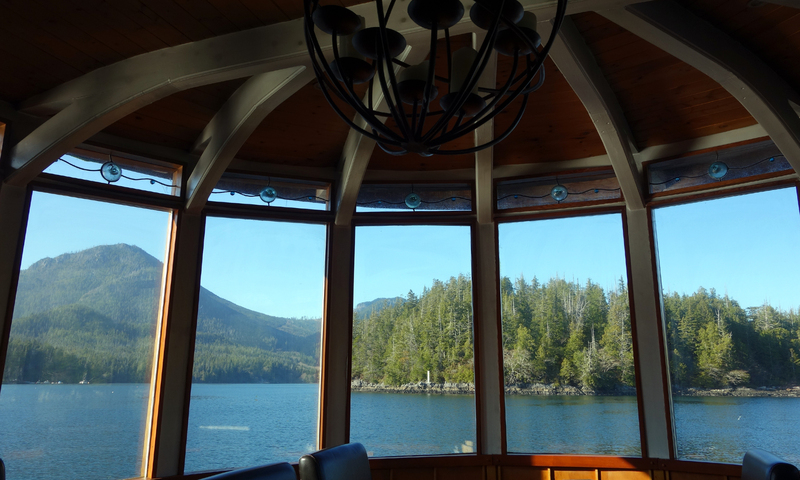 Once in Tofino, you have to travel by water or air to get to InnChanter. By water taxi, travel time is approximately one hour, and by seaplane approximately 15 to 20 minutes, weather dependent. How much does the water taxi or plane cost? These vary depending on the time of year and how many people there are in your party. Contact the airlines directly (see above) for the day’s flights and rates. Contact us directly at InnChanter and we can assist you in your travel plans and possibly recommend a great whale watching trip to make your vacation even more special! You are traveling to a wilderness location where weather and conditions are unpredictable and beyond control. Be prepared to stay an extra day if the weather prevents seaplanes or boats from running safely. It is always recommended to bring an extra set of warm clothing and waterproof rain gear and footwear. All attempts are made to make your stay comfortable and safe. Please let us know well in advance of your arrival if you have any specific dietary restrictions, allergies or requests. Our remote location limits access to specialty foodstuffs and we need advanced notice to make menu modifications. Please note that the boat is powered by 12v solar panels so our power supply is very limited. The battery reserves are needed to run the boat. We are unable to charge customers’ laptops, cell phones or other devices. Thank you for understanding. Space is limited. Should you have a specific travel time in mind, please book early to avoid disappointment.